(CNS): As the political campaign heats up ahead of the May election, those who have followed Cayman’s politics over the last decade will see a number of repeat candidates making new promises, changing their support, running with new teams or parties, and even a number of major u-turns on previous policies. An old copy of CayPolitics that found its way to CNS this week shows exactly how much a politician can change in a decade. Ellio Solomon, who is now a staunch supporter of former premier McKeeva Bush and a leading member of the UDP, was not always that way. In a 2003 edition of his magazine he supported one man, one vote, questioned the virtue of cruise berthing facilities and criticised Bush for being indecisive. Solomon was the founder of CayPolitics, a controversial website and magazine launched in 2001 that claimed to get at the truth of the political issues of the day and offered a forum for people to comment and ask questions. The site became a popular read in Cayman as Solomon was critical of the government of the day and pushed heavily for freedom of information and freedom of the press. Unfortunately, CayPolitics was closed in 2004 after Solomon was fined $1,000 for contempt of court after an anonymous person commented about the Euro Bank trial on the website when a media gag order had been placed on the controversial case. In a number of articles in the November 2003 edition of the CayPolitics magazine, Solomon questioned the leadership qualities of McKeeva Bush and accused him of suffering from myopia over cruise tourism and his failure to appreciate the importance of stay-over tourism in the face of his efforts to push for cruise berthing in George Town. In an editorial on one man, one vote, Solomon was heavily in favour of the system, in stark contrast to his position last summer when he campaigned against it in the lead up to the referendum on the issue. In 2003 Solomon also accused his party leader of being indecisive over the national lottery. 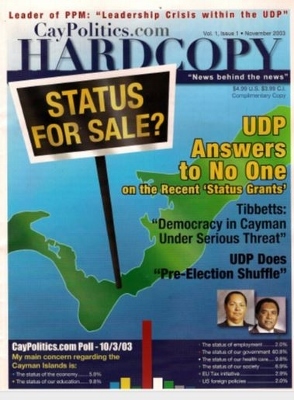 See the November 2003 edition of CayPolitics below. Gotta love politicians. You can always count on them doing what is in their best interest. Did anyone else notice that the for sale sign is stuck right in the middle of the West Bay Road that McKeeva has since given to Dart? No it isn’t – it’s somewhere out by Red Bay / Prospect. Ah ha! Ellio unmasked by his own words! Nothing can be more effective. It shows that Ellio is not wedded to any defined philosophy of politics. Not surprisingly, he practises a politics of convenience and opportunism which gives priority to advancing his self-interest. I hope the good people of George Town will send Ellio packing in May. After all the grandstanding on Rooster and polluting the fresh morning with his nonsensical ramblings, he has failed to make a diffrerence for Cayman. Hang your head in shame, Ellio! From what I have heard, Ellio supports OMOV – just not single member constituencies, which was engrafted on the OMOV proposal recently raised. If the GTowners vote him out, will he go work for the C4C main supporter, Randy Merren again? will be very interesting to see the C4C and the UDP'er together again….Ha Ha Haaaaa! It appears that the main objection Mr. Solomon has was not OMOV itself – but rather Single Member Constituencies. Read the article on the link and note where reference is made to dividing the country up into 18 pieces, as opposed to uniting the country. As a new voter, there are certain traits I want to see in those I would like to elect such as honesty, virtue, intelligence, and humility. At times, however, humility can mean recognizing when you were wrong. Many of the comments sound as though the authors have never changed their minds about anything. Now, unless there are alot of people in Cayman who were born with all the right answers, I'd hazard to say it seems more like hard headedness, hypocrisy, and sounds holier-than-thou. No matter who comes into the race, they have changed their positions in some way over time. The main thing is NOW. Can they prove that their concerns arewith the people and not on their pockets? Have they conducted themselves in a manner that indicates they have changed for the better (whatever that may be) rather than just saying so? This fool's fault is that he has not a genuine bone in his body- which is massively different to merely changing positions. He could have never changed positions in what he said and the result would have been no different than now-an opportunistic illiterate leech who has contributed nothing, ever. All he has provided us with is shame. I am also really up set that all of you guys are complaining so much, you GT’rs ticked his name on the box and voted him in. My problem is now if he doesn’t get back in the house he will receive a pension for life!!!! This policy ( law ) was put in place by the PPM…. Ohforgot short term disease. At this time I only see 4-6 persons who may be suitable to vote for in this up coming election, unfortunately they are not in my district and sadly will not be voted in. @ 16:37 – LOL LOL LOL yea yea your right. "At the end of the day" thatcoulnd ot be so fitting for his May exit from the LA and GT arean. Now those words with come to pass, and we all can say, "At the End of the Day" Ellio has left the building! Its just another day; and the end of the day! He gave up on “fiscal prudence” a while back when it became abundantly clear he had not the foggiest of ideas what the hell it actually meant. How many brothers does the guy actually have? 10 bucks for the nearest guess. Sorry, he can't count that far. The good news here is tha he can change. Maybe someday he’ll change into a decent person. This is a Daily something that happens in Politics /Offices when ever someone see that they can gain something out of the situation they are on that person side. They are all birds of a feather. It's never ceases to amaze me to see what money and power can really make a man do. Sad!! Mr Bryan is also an opportunist. He also once supported the UDP (i know this on a personal level.) What qualifications/ work experience/education does this man have to run this country?! he was a reporter by chance what was his work experience prior? a bar tender and club promoter! if Mr Bryan and Ellio Solomon amongst others had to do a formal interview to be a MLA.. they would not even be considered for an interview ! canwe heighten the bar as to who represents us?! When ask on the Panel if he would join the UDP he said he would work with whoever, people before party.. is what he said… i'm sorry i have a hard time believing that. you forgot he was also a drug dealer!!!! Hello????? Agree..Bryan is a Solomon in sheeps clothing….needs the job more than the job needs him. Many more BUSTED head lines to come and no big Mac to STOP it now oh me oh my what a ting pun we island….Keep digging shake every flea out of the rugs….. I must say, i voted for this buffoon in 2009, before i knew what a BIG BUFFOON he really was and how quickly he would change his tone and saddle up next to UDP, after being so independently-speaking and so forth before the election. Now I know better, a lot better. More than likely at the last election you voted a mixed bag of candidates. This time vote straight, either straight PPM or straight Independents. Do not give this clown and his colleagues another vote. A vote for anyone other than PPM, is a vote for the UDP to return. Weak men have weak convictions. Just goes to show how insincere these politicians are. They'll take any position that will get their snout in the trough for another term. The only thing they are ever truly committed to is their ego. Alden we need you out with both gloves on please. Alden, we need you out of the House. period. goodbye… to the lot of you. Say "No" to Career Politicians in Cayman. Unlike foolio, Alden has his own career. By your measure, Alden only being there since 2001, that would mean that only Ellio, Mike, Mark and Dwayne should be re-elected, along with only new blood. What a sad pic you paint. But, but, but, what will Tony (Eden) and Mac (Bush) do then? All they've ever known is collecting an MLA salary for doing nothing? Not so. Mac also knows how to collect two pensions for doing less than nothing. Ellio is an opportunist, plain and simple. There is no principle operating at all. He never fooled me at all. The truth is, our elected officials are nothing more than a reflection of the values and mentality of the voting majority. People like Elio, and I have to mention the big christian from Cayman Brac, are very good at spewing words that are sweet to the pallet of those who are quick to swallow without chewing. Cayman will never be any better of until the average voter becomes aware and educated to the facts. This culture that has been fostered about "what my MLA has to do for me to get my vote" is part of the problem. All too often, people are selling their vote (s) to the highest bidder. A politician knows that if he wants to win, all he or she has to do is throw money around. I will look with interest to what takes place in East End, where the current MLA will be up against another "independant" who is being supported by the former Premier and his ATM. This will be a good example of my point above. Will the people of East End vote for someone who has principle, or will they be blinded by the haze of fast cash and promises? I, as a 6th generation Caymanian, am very concern for the direction that this country is going; and we have no one to blame but ourselves. Ellio…. disgusting specimen of a man.. you certainly showed us your true colours.. you maybe fooled us once but it won't happen again! Hey come on yall. Yes Ellio has changed his mind and if we look back through the last 12 +years, you will find that the previous leader of the opposition, the present leader, two previous speakers of the House and a host of other political relatives and friens , for e.g. C4C members have all changed their minds and their positions in so many different wayy. To quote the now PP Leader "my thoughts are still evolving on this issue". You are missing the point. No one is saying that it is impossible to change one's mind, e.g. experience can give you a new perspective. The views of thoughtful people do evolve. I believe that was the case with the Rollover Policy. It is honourable to explain why your views have changed. However, when one is slamming an individual one day and in bed with them the next it makes you wonder. When one can inexplicably take a diametrically opposed view on a major public policy issue one day but then argue equally as passionately against it the next but there is no reason for the change other than the change of bedfellows it suggests opportunism. the only thing i really hope for in this election is that foolio gets whats coming to him….. He was never no good, I didn’t vote for him because I know him 1st hand! He’ll always sure to not get my vote in life!!!! "…I said I was OF the people, not FOR the people." Quote from 'Gladiator." And the mudslinging begins. Let’s talk about the wife beaters, the do-nothing’s, the 2 million dollar yachts, the 8k per month salaries being offered to people to betray their former party, etc. so much more but I need a snack. Yeah, Bernie has one at Yacht Club dock. Where did he get THAT kind of money? Oh, the Stingray City floating restaurant / dinner club all set to be a casino. That yacht. No it’s not Bernie’s. that’s a restaurant. Ask the PPM which one of them owns one? Pointing out from Ellio's own published writingthat he has done a U-turn on major public policy issues is hardly mudslinging. That is pertinent to anyone's political campaign. On the othe hand, your list suggests that you have quite taste for mudslinging. Ha Ha, I came across this in a box of old stuff I had never gone through after Ivan. read it cover to cover and realized how many people would love to have their hands on it. Guess I gave it to the right person to get it out in public. Please read it, it shows just how much Ellio flip flopped on his political views in order to get elected and afterwards. Just goes to show that he can’t be trusted! He won’t be back after the election, that’s all I’ll say. Who would vote for him again? What a a disgrace, how could anyone trust this man who flip flops and changes his mind just to be close to the seat of power. George Town voters, you cannot trust this man to represent you as he will promise the world and then change his position when it suits himself and not his people. An untrust worthy MLA and representative of the people. Vote NO to Folio in the next election. What’s the old saying ? – ” Follow the Money “. Can we expect any better? This dude decides what positions to take based on what in it for him. Cayman needs leaders not opportunists. I hear there is a real surprise waiting on him in Dog City this election. Well you know the Puppet has to do what the Master does – FLIP FLOP! Really happy to see this article. I remembr Ellio's controversial website CayPolitics very well. What a charming young man….. I want some of the Kool Aid that Mac gives the UDP to sing onto his glory. I care! It shows a total lack of character to just attack whoever it suits whenever it suits. I did not vote for Foolio and I never will. But he still has the 2003 haircut!!!!!!!! 2003? 1986 more like. He has styled himself on Larry Blackmon from Cameo, and if his political career comes to an abrupt end, he intends to make his living as the lead in a Cameo tribute band. He apparently does a wicked "Word Up" but I am not sure where you can get a red leather cod-piece in Cayman. For real yo, whats up with the kid n play cut ? My boy needs a barber, lawyer and a priest – oh wait I hear he just got baptized at the Jamaican church – he wants all those Jamaican status recipients to remember their obligation to vote for the UDP because they gave them status. I really hope the Jamaican community realises that 1. There is no obligation and 2. They were used by hte UDP and 3. Now that they are Caymanians the only obligation they have is to vote for the best people to run the country as it is now thier country too. I think that haircut is more like 1985! These comments on his hair cut are so cruel! Maybe the poor man's skull is shaped like that.